The summer of ’65 is a hot one for high school sophomore-to-be Paul and his rural Minnesota family. They are members of a nondenominational Christian sect that practices communal farm work and fellowship. At his mother’s urging, Paul lands a job in town at the Shell station where he “meets the public”–and begins to see the real nature of adults. From his vantage point of the town’s main intersection, Paul is privy to everything that goes on in their small town. His beliefs are tested in serious ways (girls, honesty, beer, cigarettes), and by summer’s end, he has grown and changed in dramatic ways. 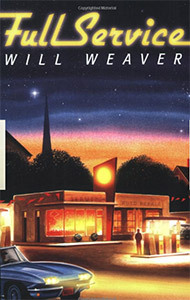 “Weaver is a wonderful stylist …a deeply felt story.”—Booklist. FS is my “baby.” It was the novel–adult, young adult–I didn’t care, that I had been trying to write for many years. I wanted to focus on one summer when, for me, everything changed. I also had the idea that most of us have had such a summer, and it didn’t matter if it was 1965 or 2005. I also like that this novel deals in good part with matters of religious faith and doubt. That’s something you don’t find much of in young adult fiction.